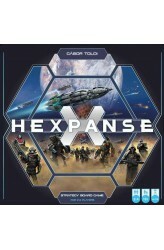 Hexpanse is a fast, hexagon based tactical board game. In the game players are interstellar commanders and warlords who are battling for different planets. The players can win the game in two ways: 1. The player defeats the opponent’s commander(s). 2. The player builds up the 9 units long pattern (a unique formation) which is selected randomly from the pattern deck at the beginning of the game. During the game the players basically use their own soldiers, however, if they want they can deploy characters and special ally faction units on the planet surface. They can also use special action cards to get more units, speed, wealth or fire power. On every turn, the players do the following things in order: 1. Their wealth growth based on their influence. 2. The player c..